I was born and brought up in Hyderabad. I did my intermediate in Orbit IT Solutions. I learnt computer graphics and animation. Soon after completion of the course I participated in Zee Saregamapa. Though I am from Hyderabad, Hindi was an unfamiliar language. None of my friends had ever heard me speaking in Hindi .I went to Delhi to participate in a programme by Sangam. There I met Anuj Kapoor who was the judge. He told me that he liked my voice and he would be contacting me for a future programme to be organised by Zee TV. A few months later, he called me up and invited me for the audition of Zee Saregamapa. I had never sung a Hindi song before. My father told me that I needed to brush up my pronunciation in Hindi to do full justice. So I went to Delhi to stay with my uncle and he suggested that I listen to songs sung by Rafi and Kishore Kumar to pick up the finer nuances of the language. I practised one song and went for the audition. Adesh Srivastava was one of the judges at the audition though at that time I didn't know who he was! I was looking at him while singing and strangely he did not show any expression. I thought that I had to return after that audition was over. But Adesh Srivastava announced my name first among the selected singers. I was elated. Then I went to Mumbai for shooting round. I asked my friends to give me a list of good Hindi songs. I selected the title song of Dil Chahta Hai for the first round. Everybody appreciated it a lot. A few felt that I should pay more attention to the accent. So I took to conversing in Hindi with my family and friends. Over a period of time, I started singing like a professional. My childhood dream was to become a playback singer. The Zee Saregamapa show made me realise my dream.Music director Koti called me for a song soon after the Zee show. He offered me a song in Premante Inthe. He was so impressed that he gave me two more songs. Sometime later I sang a song each in Alag and Dil Diya Hain. One morning I went across to meet Nagarjuna and he asked me for a CD of my songs. Within half an hour, we got a call that I had been signed to sing a song the same evening. That's how “Dunnessey” in Boss came about. I then met music director Chakri who offered me a beautiful song in in Bhagyalakshmi Bumper Draw. I also sang in Adilakshmi,a film by Chakri. I sang a few songs in Nikki & Neeraj and Brahma. I performed at the latest conference of ATA and toured USA and Canada. I have been a part of the musical shows of Adesh Srivastava whenever he has gone abroad. I will be going to the US again in April 2007 accompanied by a well known national-level female singer. You have achieved your dream of becoming a playback singer . What next? I have a lot more to achieve. I have to sing for top heroes. I don't want to remain a playback singer but want to be a stage performer who can sing and perform at the same time. My mother goads me to achieve excellence in whatever I do and I abide by her valuable advice. I have still along way to go. In Telugu SP Balasubramanyam, Janaki and Chitra. In Hindi Shaan, KK and Shreya Ghoshal. Who is favorite music director? Which kind of films do you like? I don't watch movies much. I listen to the songs most of the time. Have you got any acting offers? I got a few offers. But as I said, I don't want to get distracted. I want to concentrate only on singing. I just enrolled in first year BSc in Mumbai. Do you believe in maintaining an individual singing style or prefer to imitate someone else? My mother told me that I should never imitate. Some people are good at it and if it suits them, fine. But personally speaking I want to be known by my own individual singing style. You are just 18. Voices do alter as one grows older. Do you think yours is suited to mature songs.? My base is good but I know it is still developing. Practising for Saregama helped me immensely. How much time do you give for practice? It used to be roughly eight hours during Saregama. Now it is two hours.I practice Kharaj learnt from Jangayya sir.I also do some exercises for voice modulation and control. Have you learnt classical music? Yes, both in Carnatic and Hindustani styles. SP Balu has the knack of modifying his voice to suit different actors. He is a pastmaster at it. Do you do the same? SP Balasubramanyam is my role model. I have a long way to go and will learn from him. Any other hobbies apart from music? I was a state level champion in skating. I love playing badminton but these days there is no time for anything else other than music. When your peers are enjoying college life and socialising you are already working. Do you resent missing this important phase of your life? I love singing. No I don't resent anything. Till last year I was taking pocket money from my parents. This Diwali I gifted them a Ford Ikon. Which youngster can do that? They are happy with my success and seeing that makes me happy in turn. Do you get female fan mail? Plenty! There are SMSs from girls proposing marriage and holding out dire threats like suicide if I dare refuse! It is upsetting to see such hysteria. Since then I have stopped handling the mail personally. A father from San Jose sent a marriage proposal for his daughter who was my big fan. My sister intervened and saved the embarrassing situation. Any message to the visitors of idlebrain.com? Enjoy the music. Don't encourage piracy. Be safe! 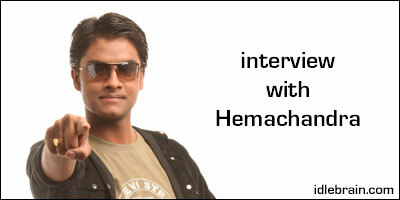 click here for an article on Hemachandra.